Efficiency: (dB / W / m)? Acapella products are hand-made and built to order in Germany. 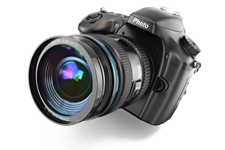 Dimensions: W x H x D = 150 x 320 (355 with Groundplate) x 360 mm. The new LaCampanella 2 and LaCampanella Alto 2 now use a new, larger (450mm, about 18″) hyperspherical horn. The Violon (Violin) is built from a ION/plasma tweeter in its own enclosed chassis; a midrange (non-compression) horn, built using a very strong and thick acoustically neutral composite material using a Dynaudio driver; and one 10″ SEAS driver for a woofer in the sealed enclosure.The Violon Highs are the same as the Violons except that there is significantly more internal bracing and dampening, more expensive components and Acapella’s own silver wiring are used in the cross-over. Their Sub Octave is an additional 10″ SEAS driver for a total of two woofers in the sealed enclosure.The Violon box enclosure can be separated from the horn assembly and the tweeter comes in its own 30lb chassis that slides into the back of each Violon. Lately, however, the speakers are shipping with the tweeter already installed in the box enclosure.With the early Violons, the Violon 1 over 10 years ago, for example, they were hard enough to drive that we would always recommend a larger solid-state amp. A lot of work has been done over the years to improve drivability and now Acapella Violon speakers are proficiently driven tube amps like the Einstein 65 watt OTL and filled very large rooms with sound. 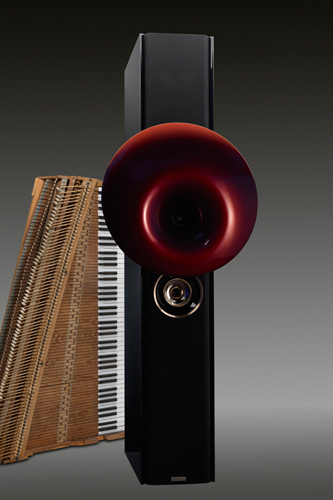 The Cellini is a new (2015) speaker from Acapella. It can be thought of as a slightly larger Violon but with a hyperspherical horn. Acapella first used a hyper spherical midrange horn in the Poseydon speakers. This horn configuration offers an extraordinarily open and transparent sound in a more compact home loud speaker system. This highly musical midrange is traditional accompanied by the Acapella Ion Tweeter TW 1. The bass foundation is provided in a sleek housing that also serves as the support for the Ion Tweeter and the spherical horn. 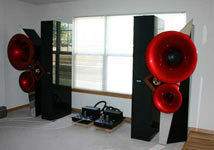 The complete system recreates the sound of any type of music with absolute authenticity and a certain mysterious magic. There is a truly new Campanile! This Acapella classic has been updated to include a center mounted hyperspherical horn, like the larger Apollon and Poseydon. Pictures to follow. The Campanile is built from a ION/plasma tweeter in its own enclosed chassis; a midrange (non-compression) horn, built using a very strong and thick acoustically neutral composite material using a Dynaudio driver; and four 10″ SEAS drivers for woofers in individual rather large sealed enclosures (2 woofers per 30″ by 12″ by 28″ heavily braced box).The Campanile Highs are the same as the Campaniles except that there is significantly more internal bracing and dampening, and more expensive components and Acapella’s own silver wiring are used in the cross-over.The Campanile is shipped in 3 sections (top, middle, and bottom) and the middle section can be detached from the horn assembly, if desired. The tweeter comes in its own 30lb chassis that slides into the back of each Campanile. Delivery time for the following loudspeakers can, depending on special requests from clients, take from 3 to 9 months. Prices listed are for normal standard products, special orders will be priced individually on request. Acapella first used a hyper-spherical midrange horn in the Acapella “Poseydon” and “Apollon” speakers. This horn configuration offers an extraordinarily open and transparent sound in a more compact home loudspeaker system.The pair of Atlas speakers is shipped in 3 crates (two tower units and one crate for both horns). The tweeters are shipped already installed inside the tower enclosures. Acapella has developed a floor to ceiling speaker that can be placed even in the smallest spaces with its slim housing. Fine adjustments to the ion tweeter and the midrange horn unit can be made in order to adapt the loudspeaker to every acoustical environment. 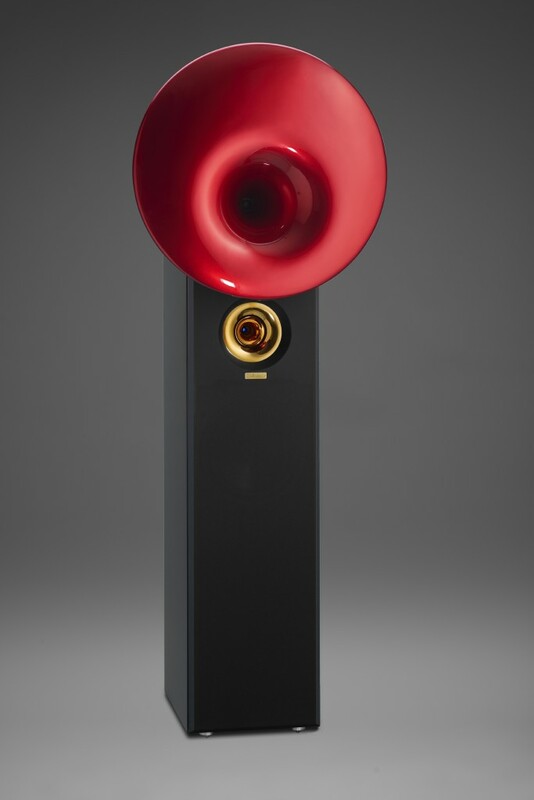 The hyper spherical midrange horn transmits the range of 350Hz – 6kHz and thus an area of more than four octaves. This is the most sensitive hearing range of the human ear. Six bass drivers with 10 inch diameter produce the musical base in the lower frequency range. The pair of Triolon speakers is shipped in 2 crates (one for the two heavy 600 lb. tower units and one crate for both ‘swords’). Pure silver wire used in the signal path. between the right and left channels. Output Voltage ± 86 V, max. Output current 160 Amp, max. Thermionic Power 2 kW, max. Output resistance max. 0.2 Ohm. All balanced In- and Outputs are ground free.